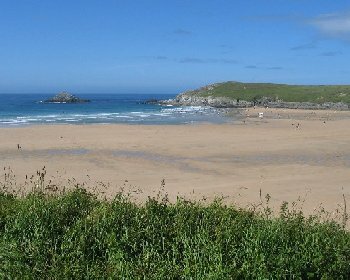 Crantock Beach is a fabulous sandy beach with a huge expanse of sand at low tide. There is also sand along the River Gannel and also extensive dunes behind the beach. Signs warn of deep under currents, large breaking waves, risk of cliff falls. Also do not swim or use inflatables in the River Gannel. Lifeguards in summer. See Beach Safety Guide. Access to the beach by the car parks is via a short path through the dunes. There are also steps down at the west part of Crantock Beach. Dogs allowed all year at Crantock Beach. Crantock village is approximately 4 miles from Newquay. On the A30 near Indian Queens turn onto the A39 at the Highgate Hill roundabout. Proceed on the A39 north until the next roundabout then take the 2nd left (signposted to Newquay) onto the A392. Follow the A392 through Quintrell Downs and then to the outskirts of Newquay. Cross one roundabout and at a second roundabout, turn left onto the A3075 (signposted to Crantock). Shortly after the roundabout, turn right (again signposted to Crantock). Follow this road for about a mile and at a junction turn right (signposted to Crantock and Crantock Beach). Continue on this road and when reaching Crantock village turn right (signposted to Crantock Village and beach) and then take the next left (signposted to Crantock Beach) and follow this road down to the Crantock Beach car parks. Alternatively drive past Crantock and park at West Pentire. Crantock Beach can then be reached via the coast path. To the north of Crantock village there are 2 car parks which are a short distance from Crantock Beach (the first of these car parks is much cheaper than the 2nd car park which is National Trust and very expensive). There are also 2 car parks at West Pentire and you can walk from West Pentire to Crantock Beach via the coast path. Yes, at the Crantock Beach car parks. Café, beach shop at the first Crantock Beach car park, beach shop across the River Gannel.